At the WMU-AAUP chapter meeting on November 10, 2017, the faculty voted unanimously in favor of a resolution to honor Dr. Howard Bunsis, professor of accounting at Eastern Michigan University, for his eight years of service as chair of the national AAUP Collective Bargaining Congress. 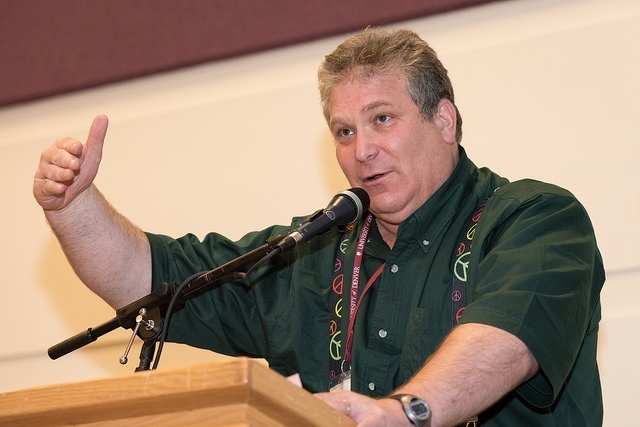 During his tenure as AAUP-CBC chair (2009-17), Howard was an active and supportive friend to the WMU-AAUP Chapter and a tireless advocate for collective bargaining rights, higher education as a public good, and the empowerment of faculty nationwide. Full text of the resolution appears below the image. With our congratulations on the completion of his eight years of service as chair of the AAUP Collective Bargaining Congress, we offer this resolution to acknowledge at least in this small way the great debt of gratitude we owe him. And we wish for him going forward the lighter workload that he has clearly earned and deserves, the satisfaction of his positive impact on the future of the profession and on thousands of lives, and finally, more time to spend on other things that matter to him and especially with the people who matter most to him: his family. After more than four years in the demanding role of WMU-AAUP grievance officer, John Saillant (English and History) will step down effective August 14, 2017. Throughout his years of service, John has been a stalwart union advocate and has provided support and guidance to countless faculty colleagues through the grievance process, tenure and promotion appeals, disciplinary proceedings, and workload appeals. We don’t throw around the word “tireless” lightly at Montague House, but John has more than earned that descriptor. During his time in office, he has met with, listened to, corresponded with, counseled, and assisted scores if not hundreds of faculty members, from every college on campus and most if not every department. We are all going to miss John, but we could not be more thrilled that he is about to embark on what is quite possibly the most well-deserved sabbatical of all time. John’s commitment to the foundational AAUP principles of academic freedom, shared governance, and especially due process, along with his meticulous, analytical approach to problem-solving, not to mention his patience and kindness (and sense of humor) in even the most high-pressure situations, have been tremendous assets to the Chapter and to the faculty. When we welcomed John to the WMU-AAUP leadership team in 2013, we especially admired his preparedness, his smarts, his calm and steady demeanor, and his unshakeable sense of justice. Four years later, we know now that we did not at that time know the half of what John would bring to the Chapter. John, we can’t thank you enough for all you’ve done for all of us. Colleagues, please join us in letting John know what his service has meant to you. And John, we wish you all good things as you move on to your next adventure. Dr. Robert Trenary (Computer Science) has been named interim grievance officer for the WMU-AAUP, effective August 14, 2017. Robert comes to us with extensive experience in labor relations, including union leadership experience in the K-12 sector prior to his joining the faculty at WMU and, more recently, 15 years of service on the St. Joseph County ISD School Board. Since his arrival at Western, he has been an active union member and has served multiple terms on the WMU-AAUP Association Council. An unswerving and well-informed union advocate, Robert brings to the interim grievance officer position extensive knowledge of the contract and a strong commitment to serving the faculty. In addition to voting unanimously to appoint him to the interim role, the WMU-AAUP Executive Committee also recommends Robert unanimously to serve as the Chapter’s grievance officer for the two-year term that begins in September 2017 and runs through August 2019. Next month, the Association Council will meet to discuss this recommendation and hold a confirmation vote. In the meantime, we could not be more delighted to welcome Robert to the WMU-AAUP leadership team as interim grievance officer. We are grateful for his willingness to accept this challenging role. Robert joins us officially on August 14 (although he has already been spending a lot of time at Montague House), when long-serving WMU-AAUP grievance officer John Saillant (English and History) will step down after more than four years in the GO role. Read more about John here, and please join us in expressing our gratitude for his outstanding service as grievance officer since April 2013. We will miss him but wish him well as he completes his stellar tenure as union officer and moves forward in pursuit of new challenges. Click here for the full letter and instructions for how to sign on. A Stanford graduate student originally from Sudan was detained and handcuffed at JFK airport in New York on Saturday. The student, a Harvard graduate, is a legal resident of the United States, where she has lived since 1993. Two faculty members at UMass Dartmouth, Dr. Mazdak Pourabdollah Tootkaboni and Dr. Arghavan Louhghalam, were detained at Logan airport in Boston on Saturday on their way back from attending an academic conference in France. Professors Tootkaboni and Louhghalam are both originally from Iran and have legal resident status in the United States. A district court ruling in Boston early Sunday ordered their release and blocks similar detentions at Logan. In November 2016, the WMU-AAUP faculty voted by an overwhelming margin to approve a Resolution in Solidarity with Western Michigan University Students, including the international and immigrant students for whom the Executive Order raises immediately pressing fears. The Resolution was a good first step, but now we must do more to stand in solidarity with these students and with our international and immigrant colleagues. Talk with students and colleagues. Make sure they know we have their backs, that we will support them, that we will listen to them, and that we will not betray them. Contact President Dunn and urge him to take a public stand in support of our international and immigrant students and colleagues. Updated January 31: Read President Dunn’s statement here. Print out a copy of the Resolution of Solidarity and post it on your office door and/or contact the WMU-AAUP office to request a solidarity card for your office door. Sign on to the Academics Against Immigration Executive Order letter and share it with colleagues. Join or donate to the American Civil Liberties Union to help them bring legal challenges against discriminatory activities resulting from the Executive Order and follow them on Twitter to stay up to date on their progress. Participate in demonstrations against the Executive Order and use social media as another way to make visible your support for and solidarity with students and colleagues. Check in frequently with your favorite news sources to keep informed about this developing story. Things are happening fast and changing constantly and are likely to continue to do so. For example, a federal judge in New York blocked a key provision of the Executive Order Saturday night. On Sunday morning, the Department of Homeland Security issued a statement suggesting that it may not comply with the rulings. A White House spokesman now (as of Sunday morning, January 29) “appears to be walking back” the part of the Executive Order that would ban re-entry into the U.S. for permanent legal residents with green cards. Some Colleges Warning Foreign Students on Travel After Trump’s Immigration Order, by Michael Edison Hayden. ABC News, January 28, 2017. As protests roiled, professors who were detained at Logan airport waited, by Nestor Ramos. Boston Globe, January 29, 2017. U.S. colleges rush to help students, scholars affected by Trump’s immigration order, by Valerie Strauss. Washington Post, January 29, 2017. Sudanese student at Stanford detained, handcuffed at JFK airport, by Queenie Wong. San Jose Mercury News, January 28, 2017. University of Michigan president states support for international students, by Martin Slagter. MLive, January 29, 2017. Oklahoma University President David Boren affirms support for students, staff affected by immigration ban in statement, by Greg Brown. Fox 23 News (Tulsa, OK), January 29, 2017. Colleges brace to shield students from immigration raids, by Alan Gomez. USA Today, January 26, 2017. Colleges Are Warning Thousands Of Muslim International Students Not To Travel, by Molly Hensley-Clancy. Buzzfeed, January 28, 2017. Protests erupt at airports around the U.S. following Trump travel ban, Fox News, January 29, 2017. Protesters Rally as Doctors, Students Blocked From Entering Country After Trump’s Orders, by Eli Rosenberg, Perry Russom and Melissa Buja. NBC Boston, January 28, 2017. PHOTOS: Thousands Protest At Airports Nationwide Against Trump’s Immigration Order, by James Doubek. NPR, January 29, 2017. Many thanks to all who participated in the vote this week on whether to approve the proposed WMU-AAUP Resolution in Solidarity with Western Michigan University Students. I am please to report that the faculty has voted overwhelmingly to join the WMU-AAUP Association Council, Executive Committee, and officers in approving the resolution. This resolution is only the beginning of the actions we can and must take to make visible our shared commitment to stand with our students, as well as with our faculty and staff colleagues, during these challenging times. From here, we must turn our words into action. As many of you know, a variety of efforts by faculty, staff, students, and community members are already underway, and I encourage you to learn more about their plans and consider joining the organizers in collaboration. For the WMU-AAUP chapter, approving and sending forth this resolution is a meaningful first step as we embark on the new project that is now before us. I look forward to working together with all of you to maintain and enhance our thriving intellectual community here at Western. This community is of course based on our core values of academic excellence, shared governance, academic freedom, and higher education as a public good, and we are going to need to work actively to protect these values and insist on their primacy in the coming months and years. At the same time, we are also going to need to work a lot harder to emphasize and prioritize the values of diversity, inclusion, respect, and empowerment so that our campus is a place that is safe for all of us — faculty, staff, students, and everyone else — to be who we are. Many thanks to all of you for your wisdom, courage, and willingness to take a stand for justice. Please click here to read the full text of the now-approved WMU-AAUP Resolution in Solidarity with WMU Students. The 2016-17 WMU-AAUP Contract Campaign is On! but our 2016-17 contract campaign starts now! Since our last negotiations, in 2014, we’ve seen an uptick in infringements on faculty rights to academic freedom, due process, and participation in shared governance on campuses nationwide. In this context, and in a political and economic climate of reduced legislative support for public education, WMU faculty once again face serious challenges as we approach our 2017 contract negotiations. That is why we have been working to organize a year-long campaign of events and actions to build solidarity on campus and support for 2017 negotiations. What is a contract campaign? A contract campaign supports the bargaining team by engaging the faculty to build solidarity. A visible, vocal, and united faculty sends a powerful message that we are determined to stand up for academic excellence, fair compensation, and appropriate working conditions. This approach worked well for us in 2014, and with lessons learned from that campaign, we are prepared to come out even stronger this time around. Why do we need a contract campaign? It would be great if once we won a benefit, we could consider it permanent. Unfortunately, that is rarely the case. The administration comes into every negotiation demanding concessions, and we owe our success over the years in holding them off and winning enhanced benefits to the collective action of the faculty and their visible and vocal support for our bargaining teams. Apply to serve on the bargaining team. The call for applications is coming soon, and interviews with the WMU-AAUP Executive Committee will be held in November 2016. Serving on the bargaining team not your style? That’s OK! We have lots of opportunities to get involved, build solidarity, and cultivate leadership skills. Make signs and create other materials for rallies. Talk to colleagues about the benefits of union membership and to friends and neighbors about our academic mission and the benefits our work provides to students and to the community. Share your professional expertise with the bargaining team. Write articles, blog posts, and letters to the editor in support of public higher education and the role of the faculty in the academic mission. Come to WMU-AAUP events and encourage your colleagues to attend. Watch for emails from the WMU-AAUP, subscribe to the blog (from the home page, look for the ‘subscribe’ and ‘follow’ buttons on the right-hand side of the page), join us on Facebook, and follow us on Twitter for information about upcoming events and to make sure you never miss a call to action. Look for sign-up sheets at WMU-AAUP meetings and events or click here to learn more and sign up online.